By popular demand I have been asked to share this recipe that I fluked tonight, so rather than procrastinate I am putting fingers to keyboard so I don’t forget. So in honour of improving my health and well being this concoction was created tonight. Handful of whatever herbs you have on hand (preferably fresh) I used flat leaf parsley and chives. Thaw prawns (if frozen) I do this by placing in a bowl of warm water while I’m prepping other stuff. 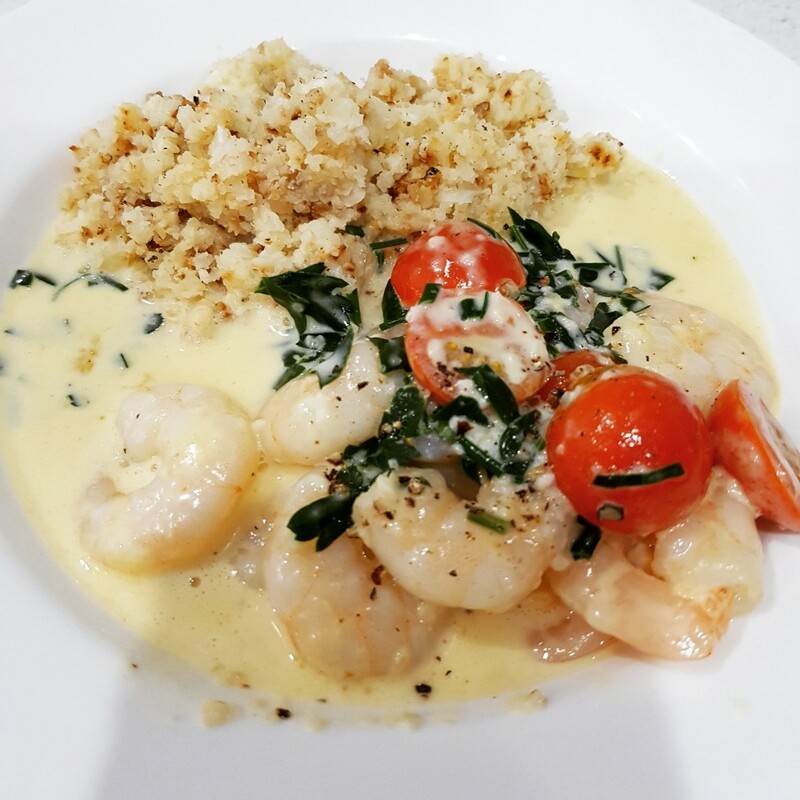 In the same frying pan, lightly fry off the garlic, strain and add prawns until slightly pink (don’t overcook) then add cream, bring to the boil and reduce to simmer. Throw in halved tomatoes and chopped herbs, salt and pepper, cook for about 3 more minutes. Plate up like a true Masterchef and throw it on whatever plate you can find. Put a sprig of fresh herbs if you want it to look fancy. More pepper and voila, dinner is served. So before you ask, no my kids did not eat this, but I did serve up some cauliflower rice (aka magic fairy dust) and a few small amounts went in their mouths. NOTE: you could add more if you wanted like, kale, baby spinach, shallots or onions it depends on what your eating plan or WOE looks like.